This pack is filled in accordance with the Growing Media Association Code of Practice for quantity measurement. Bord na Móna is a member of the GMA (growingmedia.co.uk). Rich in natural plant nutrients needed for vigorous plant growth and long term soil fertility. 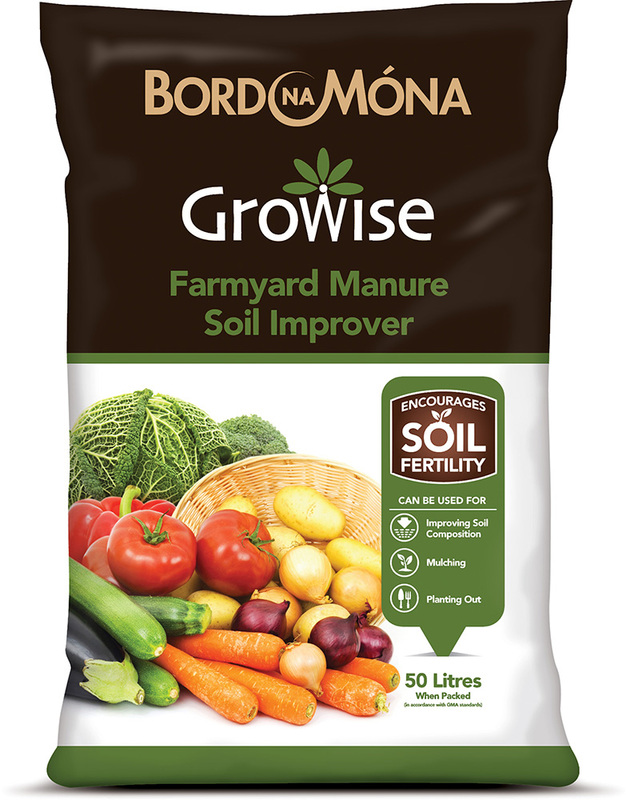 Bord na Móna Growise Farmyard Manure is specially blended for use in many areas of your garden and allotments, helping create fertile soil for plants. 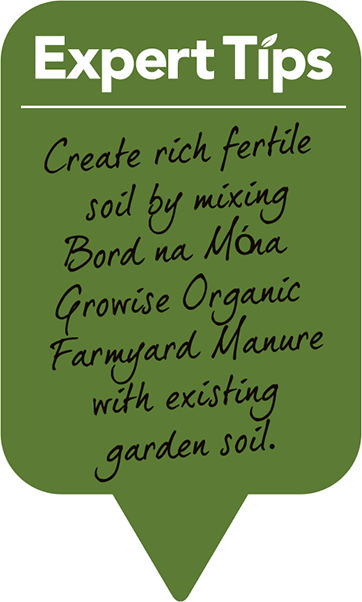 Bord na Móna Growise Farmyard Manure Soil Improver adds structure to all soil types. It helps moisture and nutrient retention. Heavy soils can be lightened by mixing with Bord na Móna Growise Farmyard Manure Soil Improver. Ensure soil is moist and free from weeds. Spread Bord na Móna Growise Farmyard Manure over the soil surface to a depth of at least 5 cm. If the soil is very heavy, chalky or sandy, apply the Bord na Móna Growise Farmyard Manure to a depth of 10 cm (4 in). Dig Bord na Móna Growise Farmyard Manure into the soil, working methodically across the area starting at one end of the plot and working across to the other. For best results this should be carried out a month before planting. Spread approximately 2.5-5 cm (1-2 in) of Bord na Móna Growise Farmyard Manure over the soil and work-in as above, a month before planting out. Dig a planting hole to the depth and size recommended for the rose or shrub e.g. twice the diameter of the root ball. Add a mixture of 50:50 Bord na Móna Growise Farmyard Manure and soil to the planting hole, plant the rose or shrub according to instructions, watering well once planted. Apply a 5 cm (2 in) layer of Bord na Móna Growise Farmyard Manure Soil Improver to beds and borders using a weed barrier membrane if desired. Use a 50:50 mixture of Bord na Móna Growise Farmyard Manure and soil as a top dressing for established plants such as roses, shrubs and perennials.